reached was so remote that access was only possible by helicopter! Thanks to your support teams were able to go where no one else would to deliver your aid to families. 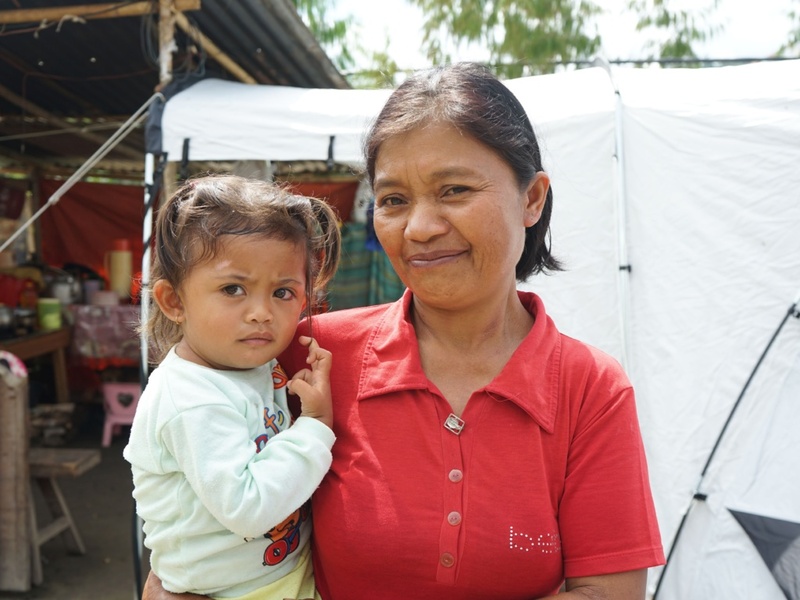 620 families received aid following the tsunami including family tents, mosquito nets, water carriers, and water filters. Additionally, families were provided with extra rope and tarp packages. First, the island was hit by a 7.5 magnitude earthquake. Then a tsunami tore through the region, flattening everything in its path and turning thousands of homes to rubble. The disaster has caused the displacement of around 75,000 people and the death of over 2000. A further 10,679 people are injured while 835 people are still missing. Families have been left with nothing as aid trickles into the region. Thanks to our supporters, families have received a large sturdy tent (with space for a whole family to be together, sleep and feel safe), a water filter to make sure they have safe drinking water, two water carriers so freshly cleaned water can stay clean, and mosquito nets to protect the whole family from insect-borne diseases. This response in Indonesia was not possible without the help of local Rotary contacts on the ground in Indonesia. With their help teams were able to coordinate with national and local government authorities to ensure we provided the right items that affected families need, and to ensure we reached vulnerable families who would not get support otherwise. ShelterBox does not stop until vulnerable families have the aid they need. 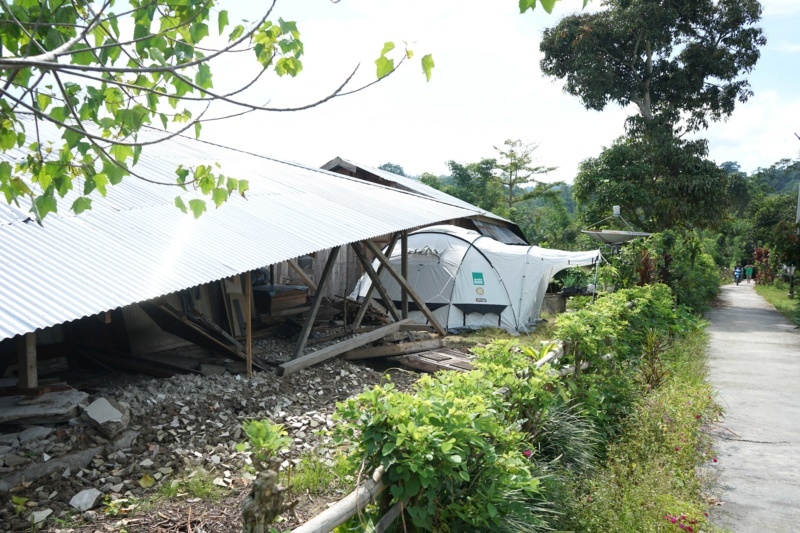 Many aid agencies have been unable to respond in Indonesia due to government restrictions and other complications, but thanks to our local Rotary contacts on the ground in Indonesia ShelterBox has continued to work to get your aid to those who need it most. Right now, a ShelterBox Response Team is on the ground in Indonesia working to help survivors. We are working with the Indonesian Government and Rotary, who are helping in our mission to help the vulnerable families who will not otherwise receive aid. 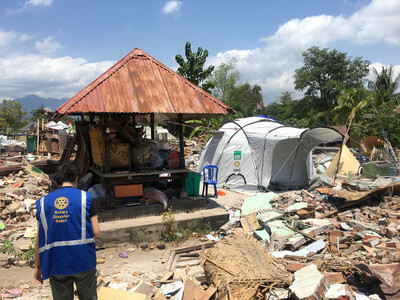 Our Rotary partners in Indonesia have also been vital to understanding the needs of the affected communities, and we hope to help families in outlying areas that would otherwise get left behind. These families need a safe place to sleep together and a safe place to be together. Large, sturdy ShelterBox tents will provide families with long-lasting and weatherproof shelter to families whose homes have been destroyed. Insect-borne diseases are also a large risk for families right now – but mosquito netting will provide them with the safety and protection they need. Drinking water supplies are also very low as many water sources have been contaminated. Providing families with water-carriers and water filters will allow them access to safe drinking water (up to 1000litres!). The team is working with our local Rotary contacts to deliver aid to families in Lombok who lost everything in the quakes. So far we have helped over 650 families across North and West Lombok. Now, in the aftermath of the earthquake and tsunami in Sulawesi, we are hoping to help many more families. 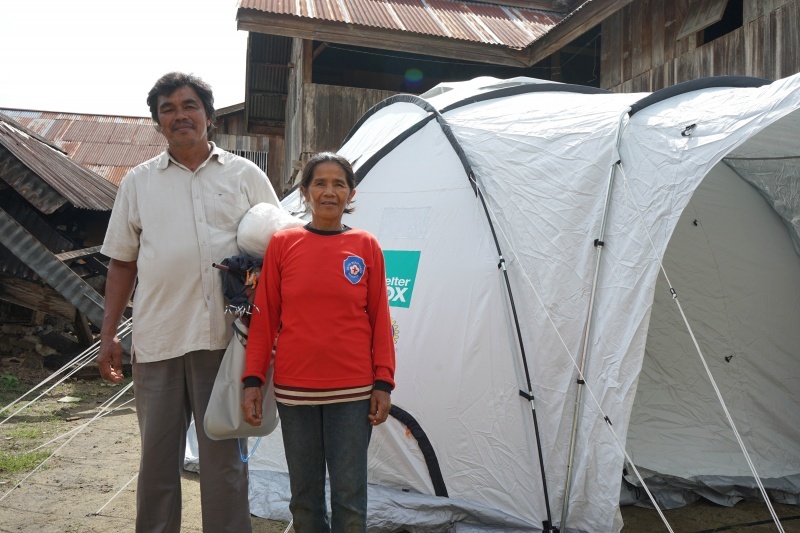 An initial ShelterBox Response Team of three people has been deployed to understand how we might be able to help Sulawesi families. Aid items such as tents, tarps, and water filters are listed as the most needed items in the affected areas. Communications are ongoing with local Rotary contacts on the ground as well as governments to ensure the right aid gets to those in need. Sulawesi is one of the main islands in Indonesia. It sits between Borneo and the Maluku islands. It’s known for its coral reefs and beautiful dive sites. The island of Lombok, where we’re responding to a series of earthquakes that hit in August, is situated to the east of Bali on the other side of the Lombok Strait. The capital, and largest city on the island, is Mataram. 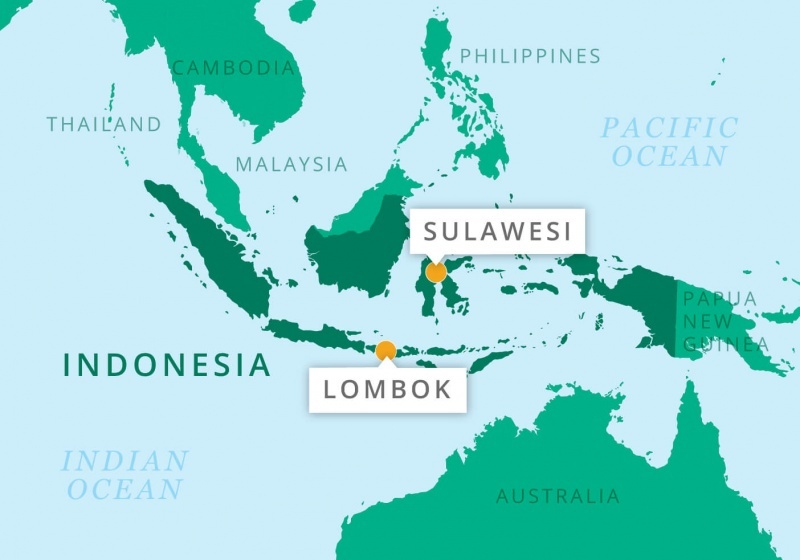 Both Sulawesi and are Lombok are popular tourist destinations. But whilst tourists are able to evacuate, thousands of local families have nothing left and are in urgent need of shelter.